For over 6,000 years humans have been consuming flaxseeds. Deemed a superfood, flaxseeds grow from a plant which produces a beautiful blue flower. This plant can grow in both tropical and subtropical climates. The fruit pod which is grown contains either golden-yellow seeds or brown seeds. Regardless of their color, flaxseeds aren’t called superfoods for just any reason – they pack a nutritional punch to boost health. Let’s examine one ounce (three tablespoons) of flaxseeds for its nutritional contents. Flaxseeds also contain good amounts of vitamin B6, iron, potassium, copper and zinc. As you can see, in such a small serving you already get many of your daily nutritional requirements. With its fantastic nutritional content it should be of no surprise that flaxseeds can add benefits to your health. Here are a few ways you can boost your health with the benefits of flaxseeds. Weight loss: Research has shown that flaxseeds can benefit weight loss. Flaxseeds contain healthy fats as well as fiber. Not only will you feel satisfied longer, but you will consume fewer calories throughout the day. Furthermore, fiber keeps you regular, promoting normal bowel movements and reducing constipation which can contribute to weight gain. Cholesterol: Not only does fiber keep us full and regular, but it can also benefit our cholesterol. 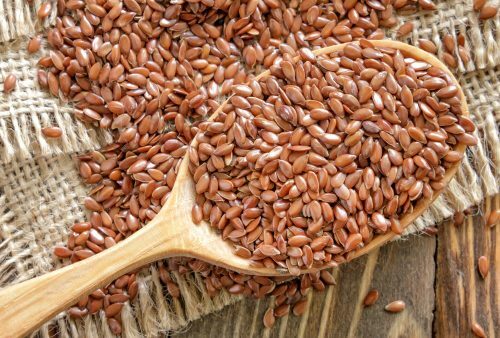 Found in the journal Nutrition and Metabolism, enjoying flax seeds can benefit your cholesterol by naturally lowering it. Gluten-free: Gluten is a common allergy, especially for people who have celiac disease. Flaxseed does not contain gluten, making it safe to eat for the majority. Antioxidants: Antioxidants fight off free radical damage which can impair vision, lead to wrinkles and mess with hormones. Flaxseeds contain high levels of antioxidants which work to benefit your skin, hair, eyes and cells. Digestion: Fiber and alpha-Linolenic acid (ALA) work together to improve digestion. Not only do they help you stay regular, but ALA, in particular, works to protect the lining of the gastrointestinal tract. Heart health: Nutrients in flaxseeds can help maintain healthy blood pressure and may prevent hardening of arteries. Diabetes: Nutrients in flaxseeds can help regulate blood sugar levels. If you’re ready to receive the health benefits associated with flaxseeds, here is how you can enjoy them. Just add a sprinkle, a teaspoon or even a few tablespoons for added sweetness and health benefits to any meal. Generally speaking, flaxseeds are safe for anyone to consume. It is important to note that flaxseed fiber content may increase trips to the bathroom. Fiber can also lead to bloating, gas, and abdominal pain; to combat this ensure you are drinking plenty of water. Concerns arise in those who take medication to lower blood sugar or blood pressure. Because flaxseeds have the ability to lower these numbers further, people in this category should not over consume flaxseeds or speak with their doctor first. Flaxseeds are enjoyable and can add many benefits to your health. If you haven’t tried them yet, start incorporating them slowly into your diet to begin feeling better.